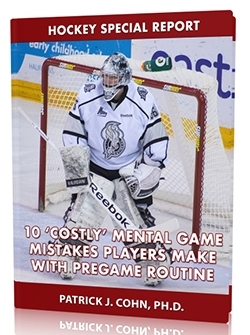 You are here: Home / Hockey Psychology Articles / What is mental toughness in hockey? When the game is on the line, do you want to be on the ice or would you rather someone else be playing during the deciding moments of a game? Mentally tough hockey players thrive when the game is on the line. Mentally tough hockey players view tough games as a challenge and are excited to play during critical moments in a game. 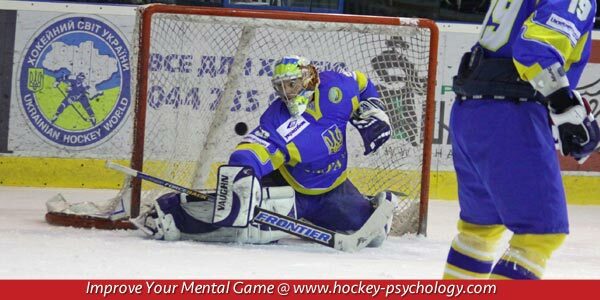 Mentally tough hockey players look for ways to tilt the balance of the game in the favor for their team. Imagine a game is tied 3-3 in the third period… if you lack mental toughness, you fear making a mistake and costing your team the game. When you lack mental toughness, you will dread taking a shift and play cautiously because you lack the confidence in you abilities. When you lack mental toughness, you feel anxious and play it safe… You allow the other team to dictate the flow of the game. When you lack mental toughness, you give the other team the advantage by not playing aggressively. Brent Moran, goaltender, is a 17 year-old prospect reading himself for the 2014 NHL Entry Draft. Moran is ranked third among North American netminders by the NHL Central Scouting Service. View pressure situations as challenges. Challenges are like obstacles courses. The fun is in finding ways to rise above the challenges. You should have an use a consistent pregame routine to help you mentally prepare for games instead of focusing on failing or not playing your best.